Born in Beirut, Youmna Saba is a singer and songwriter. She started in 2006 “by accident” playing music at an opening of an art exhibition in Beirut. This was the first time she started playing in front of an audience and this was the first time she delved into songwriting. In 2014 she released her third album Njoum (Stars) which has not only enriched her musical journey but tells a story in itself. Home to great musicians like Fairouz and Omar El-Zenni, Beirut has a very rich and diverse music scene and is one of the main cultural centers of the region. Now in recent years it became home to bands and musicians such as Mashrou3 Leila and Zeid Hamdan. This is the enviroment where Youmna Saba finds herself in. To make things clear from the start, they all sound very different from each other. In the beginning she always had a passion for playing music and singing songs and she used to play the guitar with very basic chords but 2006 marked the beginning for Saba’s musical journey. Three days before the exhibition Saba was asked to play original songs. She started to write songs, and wrote her first two songs. This marked the beginning, and she told me “This is how I started writing songs and exploring music. It was very spontanous.“ she did not have much time to think about which direction she would choose. People reacted to her music very positively, although she did not have much experience in song writing yet. They liked what she was playing and this was the marking point for her from where to continue her journey in song-writing and expand on that. At first she used to play out of her feelings and did a lot of improvisations, later on she structured and reflected more on the things she was doing. This was the time when she learned to focus more on the language and theory of music. She started studying musicology at the Antonine University and entered completly into the matter. Her studies in musicology are reflected in her artistic development, although she focused on classical arabic music and its connection to visual arts. Being a student of musicology it made her understand better the structure and the reasons behind music. 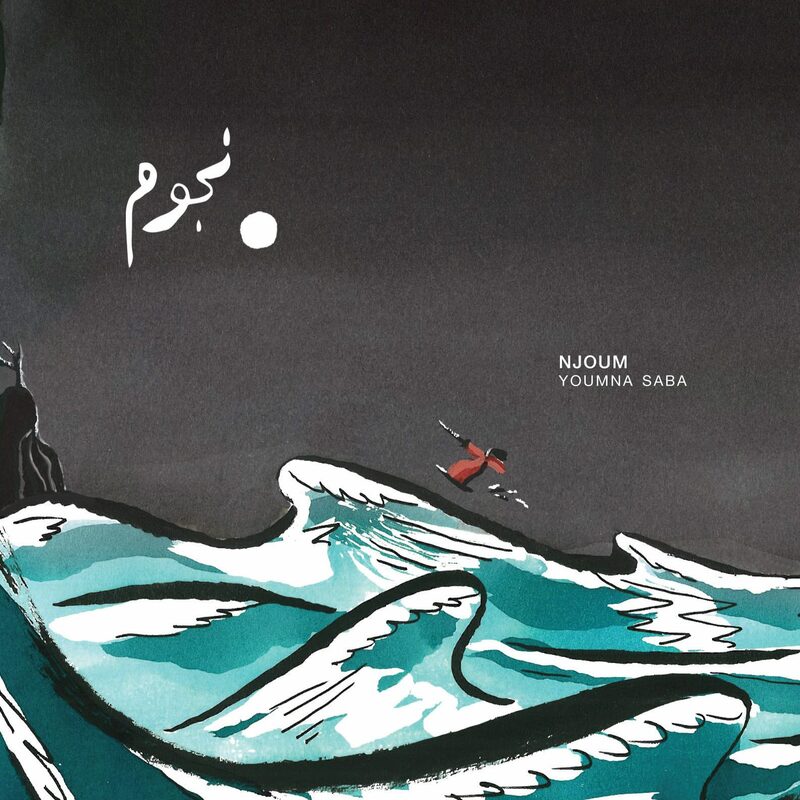 In an interview with Alex Roxwell from Now she mentioned that her song Madd w Jazr (Ebb and Flow) on Njoum is a “clear combination of maqam bayati played on the oud and counterpoint, which is a Western way of composing.” Maqam Bayati is a mode which is quite common especially in the Levant. Usually, for a musician not only one genre or artist is influencing the musical development. This is the case with Saba as well. A lot of traditions and musicians have influenced her music, which is reflected in her own music. Regional Music from the 1960s and 1970s, to which she was introduced during the 80s, influenced her a lot. Although classical music doesn’t appear in her music, she was influenced indirectly by western classical composers such as Chopin and Mozart as well as by French song writers such as Barbara whose real name was Monique Andrée Serf (1930-1997). Using electric guitars, the oud and different sounds the music of Njoum is a quite dreamlike experience and it pulls you into music straight from the beginning and only lets you go at the end of the last note. It has more instrumental parts in it than words but the music itself is telling the story with the perplexing sounds of the various instruments she is using in the album alongside her strong voice. This Album was actually developed during her stay in South Korea, where she worked with gayageum player Park Kyungso. During that time she also worked with Polish composer Piotr Kurek who influenced her music making for Njoum. Saba is not only making music, but she teaches music as well which gives her the chance to help students to understand the importance of music. To collaborate with other musicians and artists is important to her own musical journey and she wants to expand on this and wants to keep on learning as much as she can. She is currently working on her next Album which she hopes to release soon.